Dr. Blodgett is an Oncologic Imaging Fellow, Department of Radiology, University of Pittsburgh Medical Center, Pittsburgh PA. 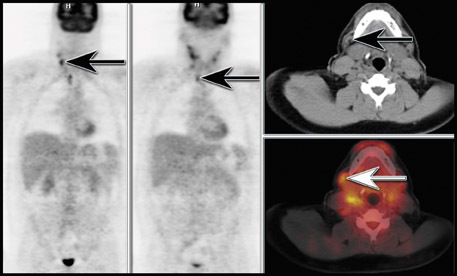 The use of combined positron emission tomography/computed tomography (PET/CT) has reduced the incidence of false-positive examinations, allowing easier differentiation of physiologic fluorodeoxyglucose (FDG) uptake from pathologic uptake, more accurate localization of lesions, and detection of lesions without an anatomical correlative abnormality. In addition, PET/CT offers incremental benefits over PET and CT separately in the evaluation of patients with head and neck carcinoma. A recent study from the University of Pittsburgh showed that PET/CT had an overall sensitivity of 98%, a specificity of 92%, and an accuracy of 94% for evaluating patients with known or suspected squamous cell carcinoma (SCC) of the head and neck. 1 A similar study by Schoder et al 2 compared PET and PET/CT in patients with any malignant lesion of the head and neck and showed that PET/CT had a higher accuracy for depicting cancer than PET alone (96% versus 90%). Staging- Several studies have shown the benefit of PET in evaluating regional nodal spread. 13-20 The use of PET/CT can add additional localization information, such as the precise nodal levels involved and even which of the nodes within a level are abnormal. It can also show contralateral disease that may not be seen on CT alone; this has a drastic impact on patient management, usually indicating the need for bilateral radical neck dissections rather than a unilateral approach. Restaging- Studies have shown that PET (and, more recently, PET/CT) is more sensitive (88% to 100%) and specific (75% to 100%) compared with combined data for CT and magnetic resonance (MR) (sensitivity 38% to 90% and specificity 38% to 85%) for the detection of recurrent or residual disease both at the primary site and for nodal recurrence. 17,21-34 The added ability of PET/CT to accurately localize disease makes it more appealing than PET alone (Figure 1), since PET can help determine the presence or absence of disease but often cannot indicate precise localization. Initial diagnosis (solitary pulmonary nodule evaluation)- Through its extensive use, several studies have emerged that have shown the utility of PET imaging in the evaluation of pulmonary nodules; many of these have shown the sensitivity and specificity of FDG-PET imaging to be approximately 90%. 43-45 In most evaluations, the sensitivity tends to be higher than the specificity, which is because of the lack of specificity of FDG. In areas where fungal infections or other infectious/inflammatory processes are prevalent, the specificity tends to be even lower. A meta-analysis summarized the data for 1474 nodules from 40 studies and showed that the overall combined sensitivity and specificity of FDG-PET was 91.2%, although a sensitivity and specificity of 96.8% and 77.8%, respectively, was more reflective of the findings in clinical practice. 46 Although several studies have reported the utility of FDG-PET and PET/CT in the evaluation of solitary pulmonary nodules (it is not generally indicated for multiple pulmonary nodules), there are several potential limitations in clinical practice that must be considered. For instance, several nonmalignant inflammatory and infectious processes such as tuberculosis and fungal infections can take up FDG and mimic the appearance of a malignant nodule on PET or PET/CT scans. 43,47-49 Sarcoidosis, silicosis, and other granulomatous processes can also appear similar to malignant nodules; therefore, it is necessary to know patient details regarding exposure, as well as pertinent medical history. 47,50 In addition, the CT portion of a combined PET/CT can often provide additional information for further characterization of pulmonary nodules. Although newer high-resolution PET scanners have an intrinsic spatial resolution close to 4 mm, in general most scanners in use today can detect 6- to 12-mm lesions, as long as they are relatively metabolically active. However, false-negative studies can be seen in primary or metastatic nodules that are less metabolically active, such as bronchoalveolar cell carcinoma (BAC). 51,52 Even a 3-cm BAC may not be detected on PET or PET/CT using FDG because of the lack of FDG uptake; BAC may be undetectable on FDG-PET up to 57% of the time. 52 Another primary tumor with reportedly low relative FDG uptake is carcinoid, which (like BAC) can be a cause of false-negative PET. 53 However, FDG- PET has a very high negative predictive value for a solitary pulmonary nodule, so a patient who may not tolerate an invasive procedure can be followed with serial CT to assess the stability or resolution of disease. Non-small-cell lung cancer- Alone, PET has not been shown to be particularly useful in determining the T status of the primary lesion and is generally not helpful in determining chest wall involvement. However, because CT is better at predicting chest wall involvement, PET/CT would intuitively be the preferred modality. A recent study by Cerfolio et al 54 showed that PET/CT more accurately predicted T status (70%) than did PET alone (47%). In the more important role of assessing the mediastinum, several studies have shown that FDG-PET is more accurate than CT (Figure 3). One of the largest studies comparing PET with CT for the evaluation of the mediastinum showed PET to have a sensitivity and specificity of 91% and 86%, respectively, compared with 75% and 66% for CT. 55 Although size criteria are often helpful for the radiologist in determining whether a node is malignant or not, there is poor correlation between nodal size and the presence of metastatic disease in the mediastinum; metastatic disease has been reported in 21% of normal-sized nodes and up to 40% of enlarged nodes have been free of malignancy. 56-58 In addition, compared with conventional work-up, evaluation with PET imaging has been shown to reduce the number of futile thoracotomies by up to 41%, usually by showing the presence of unsuspected contralateral mediastinal involvement or distant metastases. 59-61 Several other studies have shown that PET imaging is more sensitive and specific than CT and can change patient management up to 67% of the time. 62-64 Lardinois et 65 reported that integrated PET/CT provided additional information in 20 of 49 patients (41%) beyond that provided by conventional visual correlation of PET and CT. In addition, PET/CT has been shown to detect more distant metastatic lesions than other imaging modalities at the time of staging. 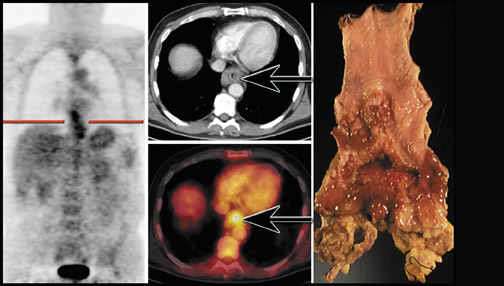 66 The presence and precise localization of extrathoracic metastases are better evaluated by PET/CT because of its ability to detect small lesions that may not have mass effect, enhancement, or necrosis. Although FDG-PET may be falsely negative in identifying the primary tumor in up to 20% of cases (particularly in patients with well-differentiated adenocarcinomas), 71,72 FDG-PET will often show the primary tumor to some degree (Figure 4). Staging- Most studies that evaluated the ability of PET and PET/CT to stage patients with newly diagnosed esophageal carcinoma have shown the major benefit to be that of determining the M status of the patient. Many studies confirmed the inability of PET to accurately predict T or N status because of its relatively low sensitivity. A prospective study of 74 patients by Flamen et al 73 reported that PET had a sensitivity of only 33% compared with endoscopic ultrasound (EUS) (81%), confirming earlier studies from the University of Pittsburgh, which showed the sensitivity for locoregional nodal involvement to be 41% to 45%. 71,72 However, in a smaller study by Flanagan et al, 74 the sensitivity of PET for detecting locoregional nodal involvement was considerably higher (76%) than other studies and was also higher than CT (45%). More recently, Kato et al 75 evaluated 149 patients for the potential incremental value of PET over CT and found that with regard to staging, PET had a 14% overall incremental value over CT. However, they also reported a similarly low sensitivity for regional lymph-node detection (32%). 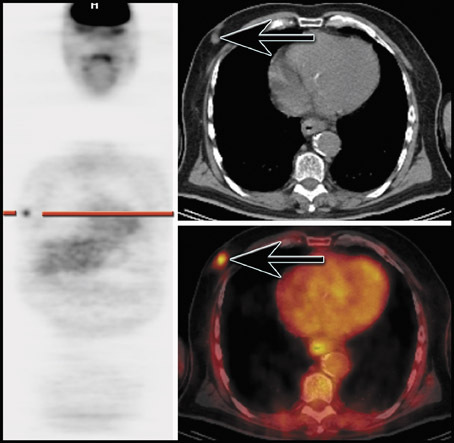 The utility of PET and PET/CT in determining locoregional nodal involvement is a consequence of the high specificity, where observed nodal disease is highly suggestive of metastatic involvement. 71-75 Positron emission tomography/CT will likely offer some diagnostic improvement over PET or CT that is performed separately. A recent study by Bar-Shalom and colleagues 76 reported that PET/CT had an incremental value over PET for interpretation of 25 of 115 (22%) sites, offering increased confidence and improved lesion localization in 15%. Initial diagnosis- Early studies by Wahl et al 83 and other groups suggested that PET may have a high sensitivity for detecting primary breast lesions >1 cm, but in the largest study to date, Avril and colleagues 84 found that almost 40% of primary breast carcinomas <2 cm were not seen with PET imaging using FDG. 83-86 There are few studies evaluating the role of FDG-PET in patients with lesions <1.5 cm. Based on the data presented by Avril et al, 85 it is unlikely that FDG-PET or PET/CT will play a significant role in the screening process for breast cancer in the near future. However, most studies have suggested that FDG-PET has a high positive predictive value, so that an incidental lesion or a lesion seen in a symptomatic patient should be considered malignant until proven otherwise (Fig-ure 5). The absence of FDG uptake in the breast does not exclude the presence of disease. In contrast to the limited role that FDG-PET plays in evaluating the axilla, it has been shown to be very useful for identifying unsuspected internal mammary lymph nodes and distant metastases. In the study by Eubank et al, 95 30% of pa-tients had unsuspected disease in the mediastinum or internal mammary lymph node chain that was identified only by FDG-PET imaging. In our experience, in patients with breast carcinoma, PET/CT is often helpful in accurately localizing lesions (particularly osseous or soft tissue metastases) that are subtle on anatomical imaging or do not have a correlative CT abnormality. In addition, PET/CT helps to differentiate physiologic FDG uptake from pathology. Response to therapy- Several studies have shown the ability of FDG-PET to predict responders from nonresponders by evaluating changes in standard uptake values. 102-106 With anatomical imaging studies, bulky areas of disease are often difficult to evaluate in the early posttherapy period. 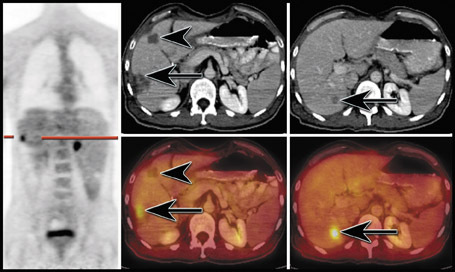 Combined PET/CT offers the strength of FDG-PET in determining early changes in metabolic activity, with the ability of CT to accurately localize areas of persistent disease. It can also assist in localizing areas with persistent uptake for potential biopsy localization. FDG-PET and PET/CT have become the primary diagnostic imaging tests for evaluating various malignancies, including those in the head, neck, and chest, as detailed above. The future of PET and PET/CT imaging will certainly address the specificity limitations of the current clinical tracer, FDG, and will target more specific tracers. Oncologic applications of PET and PET/CT in the head, neck, and chest. Appl Radiol.